Electronic cigarettes (also called e-cigarettes or e-cigs), vapes, vaporizers and hookah pens are among the terms used to describe electronic nicotine delivery systems. These products use an “e-liquid” that may contain nicotine as well as flavorings and other ingredients. The liquid is heated into an aerosol that the user inhales. Some products resemble conventional cigarettes, but others look like pens or other ordinary items. Juul resembles an everyday flash drive, which may explain its popularity among teens. The FDA has conducted 908,280 inspections of tobacco retailers, issued 70,350 warning letters and initiated about 17,000 civil money penalty casesin its efforts to fight the sale of e-cigarettes and other tobacco products to minors, it said Tuesday. 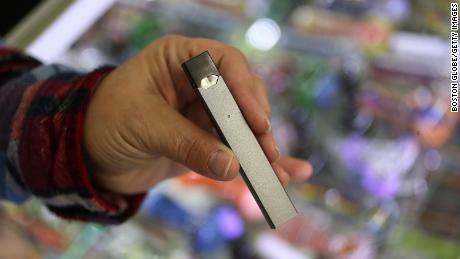 For the current “blitz,” the agency said, it also contacted one online retailer, which removed listings for Juul products and then voluntarily implemented policies to prevent future listings. More than 2 million middle and high school students described themselves as current users of e-cigarettes in 2016 (the most recent year studied), according to a government report: about 11% of high school students and 4.3% of middle school students. Overall, e-cigarette use by high school students increased 900% from 2011 to 2015, according to a separate 2016 report from the US surgeon general. On March 20, the FDA issued a warning that it would act to end the use of e-cigarettes among minors. “We are working with the FDA, lawmakers, parents and community leaders to combat underage use, and we will continue working with all interested parties to keep our product away from youth,” Davis said on behalf of the company.